This Cozy 1 BD/1BA is located in Creekside Community which is directly across the street from Trader Joe's market, Food-4-Less, Starbucks, Round Table Pizza, along with many other outlets. Coming soon across the street is the SLO Public Market with restaurants, fresh fruit and vegetables Farmers Market. Creekside offers a unique and affordable setting for its residents of tree lined streets, a beautiful club house with fireplace, a large swimming pool, hot tub, gaming room, and a kitchen for your planned parties. Also of interest is a private park at the rear of the community along San Luis Creek for BBQ's, dog walking, and get togethers. 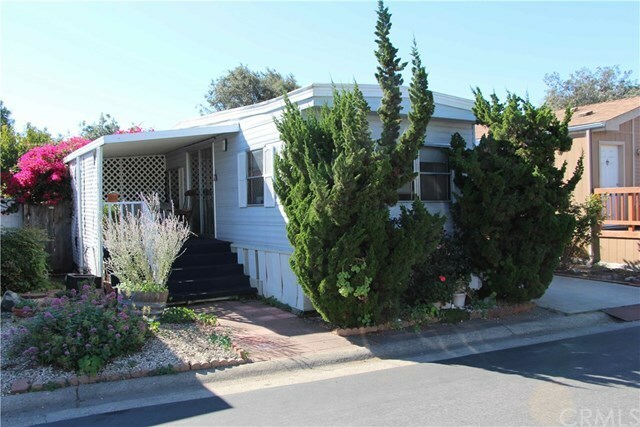 The mobile home model is a Champion, manufactured in 1972 that is approximately 624 square feet, and includes 2 bedrooms, 1 bathroom, front kitchen and a center living room opening onto a covered side deck patio. On the property are two storage sheds and a spacious side yard for relaxing and entertaining. This year (2019), this home has been leveled with all new piers with lock tops and foundation pads. A new one-piece foam insulated white aluminum roof with a 20 year warranty was installed with new rain gutters in the front and back. The water heater closet was rebuilt and a new 30 gallon water heater was placed and strapped with a drip pan. Current owners are paying a base rent of of $696.32, utilities not included. Base rent is subject to change with new ownership. Directions: The Mobile Home Park is at the intersection of Tank Farm and Higuera. Enter the park make the first real left then the first right, it is about halfway down the street on the left.